With a classic stainless steel look, and a power and precision that can only come from maritime inspiration, Tag Heuer’s Aquaracer WAN2111.BA0822 is a true gentleman’s performance watch. Going out for a lunch date, a dinner party, or out on the water, the Aquaracer is perfect for any occasion and can withstand any watery situation. This particular model within Tag Heuer’s Aquaracer collection features a brilliant blue face, the metallic shimmer of which shows off strikingly amidst silver accents. Baton hour markers are placed on the six, nine, and twelve o’clock positions with a date counter at three o’clock. The remaining hours are represented by circles, and the second hand ends in a contrasting orange arrow to focus your reading of seconds as accurately as possible. The dial itself is large at 41 millimeters making time a quick and easy discovery. In fact, you can easily determine time at, well, any time—even in the dark of night. The Aquaracer’s luminous hands and markers provide the necessary details in daylight or no light. Surrounding the impressive face is a useful brushed steel bezel with handy grips to make movement smooth and easy. 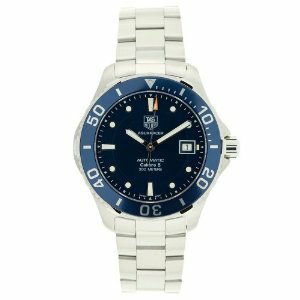 The blue of the face has a different finish from the bezel creating subtle depth and contrast as light hits your wrist. Even as a lovely accessory, the Tag Heuer Aquaracer WAN2111.BA0822 is still extremely durable. It features a bracelet band with fold over clasp and push button release, clear sapphire crystal with ultra scratch resistance, and water resistance to a depth of 300 meters or 1000 feet. A classy timepiece made for an active man, the Aquaracer will not fail while swimming, snorkeling, or diving. Tag Heuer is a respectable brand and the Aquaracer can be seen on well-known figures like Sacha Baron Cohen, who sports the black variation of the Aquaracer (WAN2110.BA0822). There is also a white face and bezel variation if something lighter in color is more your style (WAP2011.BA0830). In case you’re curious there are some potential drawbacks, though, not surprisingly, somewhat minute. The date display found at three o’clock is quite small, so if finding the date on your watch is absolutely key you might prefer something a little larger. Some users have also found the luminescent hands and markers to be less helpful than expected, but not enough of an issue to prevent a wholehearted recommendation for Tag Heuer’s Aquaracer WAN2111.BA0822.